On the Orchids of Olinda tour, visitors can learn how to grow their own plants while viewing some of the 15,000 orchids growing at the farm. When weather forecasters predict high wind warnings, Dan Judson trembles as much as the trees that surround his lush property 2,100 feet up the slopes of Haleakala on Maui. Cost: $59.95 per person, $49.95 for children up to age 9. Including a complimentary gift and lunch (spinach lasagna, salad, garlic bread, cookies, ice cream and beverages). No charge for kids in diapers. Private parties can be arranged for a minimum of 12 people. Kamaaina receive a 10 percent discount with proof of Hawaii residence. "We sweat out the weather," says Judson, president of Orchids of Olinda, a commercial orchid farm. "It really holds us hostage. We're not able to control it; all we can do is respond to it. Every time there's a major weather pattern on the radar, we have sleepless nights." The objects of Judson's concern are some 15,000 orchid plants, which he propagates with the help of his 22-year-old son, Noah, and a few part-time workers. On a three-hour tour of Orchids of Olinda's 12,500-square-foot greenhouse, visitors get a close look at fine specimens of Oncidinae Intergeneric, Zygopetalum, Miltonia/Miltoniopsis and other species. In 2000 the farm won the American Orchid Society's prestigious Riopelle Award for the best Miltonia produced in the nation that year. As Judson describes it, the tour is "basically Orchids 101. We share cultivation tips, do a repotting demonstration and answer any questions they might have. Every tour is different, depending on the group's level of interest." Since he launched the tour in 2003, Judson has welcomed visitors from the mainland, Canada, Holland and Asia. "Several months ago a big, burly truck driver from Michigan came on the tour," he recalls. "If I saw him in a lineup, I would've thought he'd be the least likely person to be an orchid hobbyist. But everywhere he drove freight, he would stop at orchid operations, buy plants and take them home. He really knew his stuff, and we had a great time talking." Judson keeps the groups small -- between six and 10 people -- to allow for personal interaction. "If there are too many people, you lose the intimacy and serendipity," he says. "Often someone will ask something, which will bring up another question from somebody else." 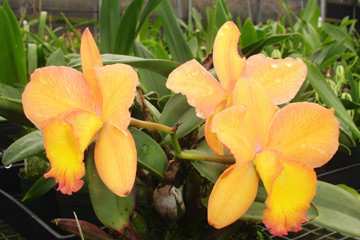 According to Judson, the aim of the tour is to dispel the mystique of growing orchids. He reminds visitors that when they see a plant at a garden shop, it's in the perfect environment, which is why it has flowered. "When we take that plant home, put it on our coffee table and it stops flowering, we get upset and frustrated because we thought we knew everything there was to know about growing orchids," he says. "But we have to recognize that being an orchidist is an ongoing educational process. I've been growing orchids for more than 20 years, but there are days when I still feel like a rookie. Only by persevering will you see success." RAISED BY GARDENER parents in Burbank, Calif., Judson grew up with plants. "I had an affinity for them from the time I was young," he says, "but I didn't think of them as something that would be a calling." In 1974, when he was 21, Judson arrived on Maui to surf and live a carefree lifestyle. "That quickly changed when I saw how expensive it was to live here," he said. "I decided I'd better get a job, and that's when I started working at restaurants." After Noah and his daughter, Jasmine, were born in the early 1980s, Judson, a single parent, realized he needed to find employment that didn't involve night shifts. As luck would have it, he received an offer to live on a property in Olinda, taking care of the grounds and doing landscaping in exchange for rent. At the time, a few of his friends were involved with orchids and urged Judson to try propagating them. He did and became intrigued by their diversity (orchids comprise the largest plant family and grow on every continent but Antarctica). 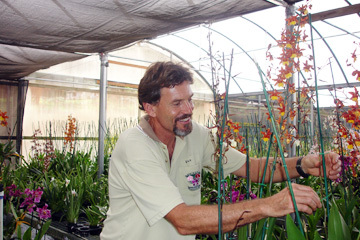 In 1988, Judson started propagating cymbidiums in a rented greenhouse at the 4,000-foot elevation of Haleakala. As time passed and rent kept increasing, he decided to build his own facility, consisting of four Quonset greenhouses, each measuring about 3,000 square feet, on a 2-acre parcel in Olinda that he had purchased in 1976 for $45,000. "I built the first of four Quonsets in 1995, and that's when I started doing more growing on site," he recalls. "When I realized the potential, I added a couple more buildings in the late 1990s and pretty much finished the construction by the end of the decade." By that time, Judson's knowledge and confidence had increased to the point where he gave up his landscaping business to devote himself to orchids full time. Orchids of Olinda now wholesales to numerous outlets across the state, including Lowe's and Wal-Mart. THE TOUR IDEA evolved when Judson noticed a lot of calls were coming in from people wanting to visit the farm. "I didn't want to open a drop-in retail operation because that would've been a whole different business model," he says. "When you live and work on the same property, you have to decide what will work so you maintain some privacy. I decided a prearranged farm tour would be a way to make a stop here interesting and educational for visitors while not disrupting our operations." He and Noah conduct the tours, which include a close-up look at orchids in various stages of development, a discussion of the greenhouse's automated watering and fertilizing system, a rundown of practical tips (see sidebar) and a potting demonstration (you can even pot a plant if you'd like). Orchids of Olinda purchases young 2- to 3-inch plants from Thailand, Holland, California and the Big Island, and nurtures them until they're blooming and big enough to sell (generally 18 to 24 inches in height) after two years. "It takes a long time to see the fruits of our labor," Judson admits, "but it's definitely worthwhile. We start off with a little plant, feed it, water it and watch it grow. Then one day we look and see a flower spike emerging! "No matter how many times I've seen it before, I feel a rush of joy, excitement and pride; some amazingly beautiful color is about to unfold! It's a miracle that always makes me smile!" Dan Judson was raised by gardener parents, but didn't think he'd follow in their footsteps. Light: Most orchids prefer less than 50 percent light; 80 percent shade is a common requirement. When in doubt, provide less light. Fertilizing: Water weakly, weekly. A diluted amount of fertilizer given frequently is a better feeding regimen than feeding a plant a lot at once. Water: Test the quality of your water supply. Your city's Board of Water Supply should be able to tell you its salt content, chlorine level and organic compounds. Environment: Keep your growing area clean. Don't use the same cutting implement on multiple plants; buy a box of single-edged razor blades and use one per plant. Disinfect the blades by baking them at 350 degrees for one hour. Make sure there's adequate air flow, which often is restricted by walls and fences. Without adequate ventilation, pathogens can take hold and cause problems. Use fans as necessary. Insects and mold: Regular use of an approved insecticide is recommended. Always do a test spraying on a couple of plants when applying something new. Check for phototoxicity in a week. Never spray the whole area until such a check has been done. Cheryl Chee Tsutsumi is a Honolulu-based freelance writer whose travel features for the Star-Bulletin have won multiple Society of American Travel Writers awards.